LANSING, Mich. — A letter signed by 120 sexual abuse victims of former sports doctor Larry Nassar on Tuesday urged Michigan State University’s governing board to oust interim president John Engler, saying he has reinforced a “culture of abuse” at the school. Engler, who served as the state’s Republican governor from 1991 through 2002, has resisted pressure to step down. He took over on an interim basis in February after the previous president resigned amid fallout from the Nassar scandal. 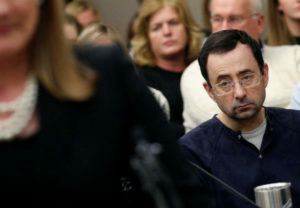 Media outlets last week reported that he sent emails to another university official in April criticizing lawyers for Nassar’s sexual assault victims and suggesting the first woman to go public with her accusations was probably getting a “kickback” from her attorney. In their lengthy written statement, the 120 “sister survivors” said they stand together against “character attacks” and that Engler “has only reinforced the culture of abuse at MSU.” Current and future victims of sexual abuse “should know they can raise their voice without being characterized as pawns too foolish to know they are manipulated,” they said. The Associated Press has reached out seeking comment from Michigan State spokeswoman Emily Guerrant. Under Engler’s tenure, Michigan State has agreed to a $500 million settlement with 332 women and girls who said they were sexually assaulted by Nassar, a former campus sports doctor who also worked with the U.S. Olympic gymnastics team. Nassar now is in prison. Of that, $75 million will cover future claims. “We stood against our abuser. We stood against an abusive culture. Now we are asking you to stand against it too and lead MSU forward into real change,” the letter said in its conclusion. Associated Press sports writer Larry Lage contributed to this report from Ann Arbor, Michigan.